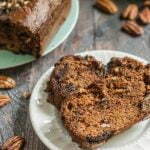 This pecan chocolate breakfast bread is a delicious gluten free treat that you can have every morning. Easy to make and freezable too! In a large bowl, whisk your eggs and then add all of your ingredients except for the chocolate and pecans. When mixed together, add your pecans and chocolate and just mix to incorporate. Bake for 40-50 minutes checking every once in awhile to make sure it doesn't get over done. A toothpick should pull out of the center cleanly and/or the top should be firm to the touch. Note* I used 2 small Moser Roth 85% cacao chocolate bars from Aldi. If you are not concerned about carbs, just use any kind of chocolate you like.